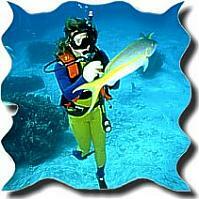 Kenya Beach Travel organizes scuba diving courses and dives for guests who would like to explore Africa's marine life. You can drop 10 - 30 feet straight into the Indian Ocean at Kisite Marine Park in Kenya which is one of Africa's most popular diving spot. Pemba, Zanzibar and Mafia Islands offers similar breathtaking experience. In Zanzibar, we recommend diving at the Chumbe Island Coral Park. The Chumbe Island Coral Park is a unique privately managed nature island reserve. It is a rare example of a still pristine coral island ecosystem. The reserve includes a reef sanctuary, which has become the first gazetted marine park in Tanzania, and a forest reserve. Chumbe Island Coral Park is a perfect destination for an eco-beach holiday and getaway. We recommend diving in Mombasa, a coral island off the coast of Kenya, which has beautiful coral reef and marine life; this makes the whole experience of diving and snorkeling awesome. Mombasa has also a deep harbor called the Kilindini, which serves as a docking station for vessels serving the East Africa trading regions. Kisite Marine Park is found off the Kenyan coast, 75 miles south of Mombasa. 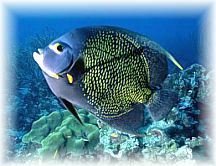 In the Kisite - Mpunguti Marine Park some of the commonly seen fish include: large numbers of pelagic fish, butterfly, parrot, rockcod, angel, manta ray. Turtles, dolphins, reef sharks are also seen. The pristine coral varieties are impeccable; corals like staghorn, brain, liliac-blue, mushroom, and lavender present unique photo taking opportunities. The colorful beauty of the coral, complimented by the large number of yellow and red tuna and snappers are unmatched. Pemba Island in Tanzania is another location - located off the Tanzanian coast, and is adjacent to the Island of Zanzibar. Not only is this Island known for its awesome dive sites but also its peaceful location. Pemba waters give divers and snorkels an incredible experience because all locations have generous amounts of multi-colored fishes and corals displayed. The Pemba channel runs deep until it approaches the coastline, and then begins a dramatic assent to create sheer walls off the coast. Mafia Island in Tanzania is a prominent world-class diving destination with some of the richest reefs in the world, with a supreme variety of hard and soft corals and diversity of tropical fish. 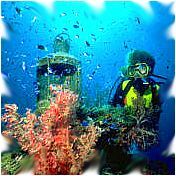 Extraordinary dive sites at Mafia offering shallow reefs of colossal beauty and richness, bommies, channels, walls and caves. 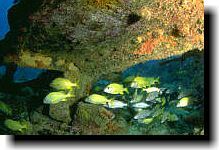 More details on specific dive destinations are below.